Our beloved Albatross that took us around the world! Hi there, I’ve just finished your book. One I found difficult to put down. Brilliantly written and a real heart warmer. I’m 49 and took up sailing 5 years ago. Purely flotilla to start with and last year got involved with some other crazy people and competed in the Rolex Fastnet race. Good times. Inspired me to do my day skipper and this year coastal skipper. 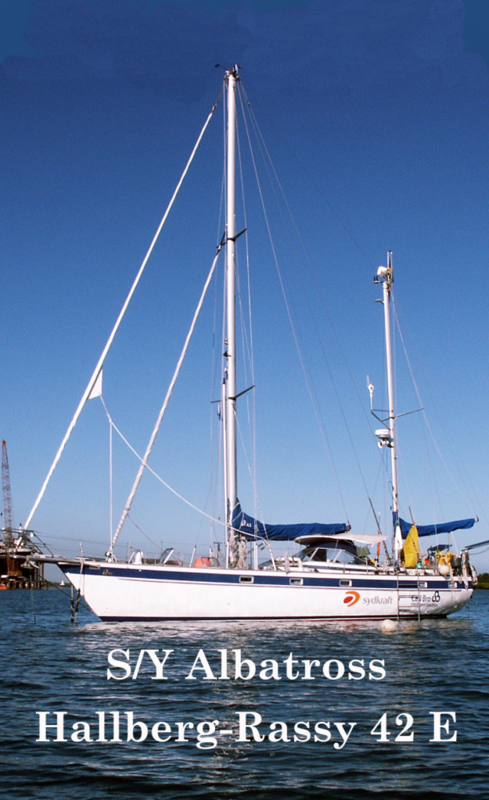 Reading your story has now pushed me to do my yachtmaster and buy a boat of my own. We,, I say my own but my wife always is beside me. You have inspired me to push further into sailing and hopefully, one day, take a couple of years out and go and see the world. Thank you both, I consider you brave and certainly not stupid. My gal and I have enjoyed listening to the audiobook version of Brave or Stupid presented by 59 North. Thank you for the good times and laughs we’ve had listening to your adventure. We’re working on our boat – a bit of a refit – a 41 year old Ericson 39. We live in Boston, Massachusetts, USA and while our plans don’t include a complete circumnavigation, we are planning to untie the lines and go south toward the Bahamas and points beyond – someday soon – hopefully sooner than later. Your story is inspirational, thanks again. Brave or Stupid by Tracey Christiansen, Yanne Larsson and Carl-Erik Andersson is a rich narration of how two best friends fulfilled their dream of sailing around the world. In “Brave or Stupid”, two middle-aged Swedish electricans are visiting D-Day beaches in France and start talking about a WWII vet that they know who has sailed around the world on a sailboat. I’ve really enjoyed this book. But we need a “what happened next”. How about some updates on this site? At the beginnning I though you would more irrationals. (Leaving few weeks after lerning sailing). I’m at chapter 20, and hurry to listen more. 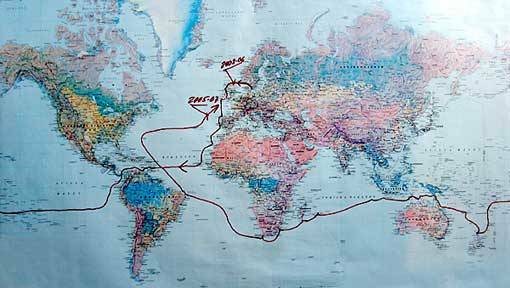 Do you have a map of your itinerary?